During the ampoules making and manufacture process,traditional fuel consumption is coal gas or LPG gas.Okay Energy provide you oxy-hydrogen for automatic ampoule filling and sealing fuel saving solutions.Okay Energy OH small portable OH200,OH300 is suitable laboratory/school manual ampoule sealing.And Our OH series large industrial OH1000,OH1500,OH2000,OH3000 etc consume some water and electric producing oxy-hydrogen gas as fuel supporting. 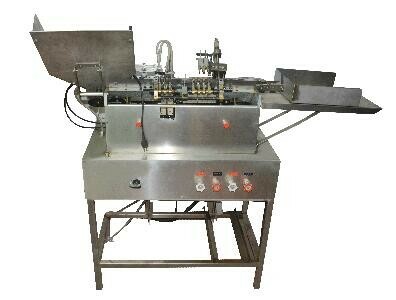 Oxy-hydrogen Flame Ampoules Sealing Machine just uses water and electricity, no gas bottle, no hydrogen gas storage, no leakage and explosive danger. it can work just with water and electricity, every litre water can be used 7~8 hours. But Liquid gas bottle need to be changed by manual moving, it is very inconvenient. Oxy-hydrogen combustion just produces little water vapour, there is no harm to the pharmaceuticals. But Liquid gas combustion produces carbon dioxide, carbon monoxide and nitrogen compounds which will impact on the quality of pharmaceuticals. The speed of Oxy-hydrogen Flame sealing method is higher than Liquid gas's. Oxyhydrogen's working medium is only some water and electric.the cost is low.